I feel like I'm becoming a travel journalist these days, but we're seeing some very interesting locations get themselves onto the global sourcing map. Enter South Africa and the picturesque coastal hub of Cape Town, which is primed to challenge for UK and European IT and BPO services. As the 21st century dawned, South Africa sought to expand its economy with one of the focal points being the English-speaking workforce. Problems existed in the value proposition to potential European customers, most notably in the high cost of telecommunications. Like the dismantling of the Berlin wall, deregulation and the elimination of the telecommunications monopoly have propelled the nation into a rising star as an offshore location for IT support, customer care and BPO work. For several years, the battle raged with the push/pull between economic development and the predominantly government-owned sole telecommunications provider, Telkom. Competition was injected into the industry with the first competitor, Neotel, commencing service in November of 2007. The government has been committed to reducing costs and implemented notable tariff reductions. In 2008, the government formed Infraco to provide fiber optic connectivity to telecommunications firms that augments a wired national infrastructure that is 99.9 percent digital. Infraco is also laying fiber optic lines from Cape Town to the UK. Larger municipalities including Cape Town have proceeded to launch broadband networks to provide less expensive voice and data services. By reducing the barriers of telecommunications costs, business is booming in Cape Town as an offshore location. 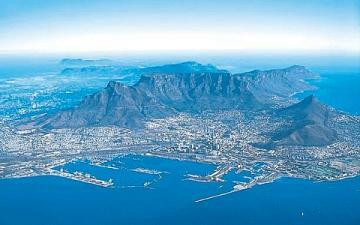 There are several factors that contribute to the appeal of Cape Town as a destination for customer care. One major key is that there is little issue with accent for customers in the UK as English is the primary language for over one million Cape Town residents. There are also benefits from a compatible time zone to Europe compared to many other offshore locales. According to CallingtheCape, a nonprofit agency promoting investment in Cape Town, call center employment grew by over 28 percent in 2008 and employs over 20,000 full time agents. The annual call center churn rate is slightly above 17 percent, roughly half the turnover rate of the UK. Further, they state that the monthly salary for an agent ranges from a low of approximately $400 for entry level and up to a high of twice that with four years of experience. Agent salaries have only escalated by around ten percent since 2004 and CallingtheCape reports UK companies saving $17000 per seat annually. While labor costs are double those of Philippines and India, they are 20% less than those in Hungary, and even more that Poland. The allure of Cape Town is not confined to just serving customers in the UK. In the spring of 2008, Royal Dutch Shell opened a call center in Cape Town to take advantage of the Afrikaans language spoke in the region. Agents service customers in Belgium, the Netherlands and Luxembourg in Flemish and Dutch. Lufthansa also has a center in Cape Town with bilingual agents fluent in English and German. We have also seen Barclays Bank, Carphone Warehouse and a major US credit card develop operational support service in the area. The growth has been virtually the same for captive and outsourced call centers over the years with captives employing a bit over two thirds of the full time agents. The annual turnover rate is five percent higher at slightly over 20 percent for outsourced agents compared to the captives. This is not surprising as outsource providers typically pay less with reduced benefits and are tasked with a higher percentage of outbound sales. As we have seen with the development of new locations for offshore work, call center is normally the first work-type to ramp-up, with business-specific services, such as banking and accounting services quickly following suit. South Africa is no exception. Like Guatemala, their next challenge is developing scale, with a labor force of only 2 million in the Cape region. It needs to develop its network of centers across the whole country, and possibly in neighboring countries, while keeping standards high and wage costs low. The recent changes in the policies of the national government and in the global market place point to a very bright future. It can be expected that many larger established global outsourcing providers will set up shop to follow the leads of major corporations to harness the potential BPO and customer care benefits offered by Cape Town. As competition develops and matures in telecommunication delivery, the costs of doing business will reduce, further increasing the attractiveness of the value proposition as a nearshore hub for European service delivery.